Florida temperatures can soar any time of year. You need reliable air conditioning in your home or business so that you can stay cool and comfortable, no matter what the temperatures outside. Whether you require an emergency air conditioning repair or it is time for a new unit, we are ready to help. Our ten-plus years in the business means that you can count on us to offer the service you need to get your home or business cooled down fast. Just as you need to feel comfortable with the temperatures inside, you need to feel comfortable about the people who you let into your business or your home. We perform background checks and drug tests on every single employee before they enter the field. Our technicians arrive at your place professionally dressed and ready to do the job. Every technician possesses NATE and EPA certification. We are experienced working with a wide range of manufacturers and models to provide knowledgeable service and quick solutions. Sometimes, all you need is a broken part repaired. Other times, a replacement may be necessary to provide the reliable cooling that you need in the Tampa Bay area’s sultry climate. While air conditioners are designed to offer service for many years, they do wear out over time. You may find that an older unit is more expensive to run and doesn’t offer the cool air that you are used to. Or, a repair may be too costly to justify on a unit that is showing its age. A new air conditioning unit is a major investment. Because of this, we offer free estimates on all replacement services. Armed with the knowledge from our estimate and assessment, you can make the right decision for your budget and your home. Whether you need emergency repair services, regular maintenance or a full replacement, we are here to help. We provide on-time service and a 100% satisfaction guarantee. We are not happy until you are happy. 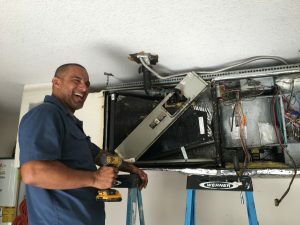 Call us today if you need reliable and trustworthy air conditioning repair in Tampa, Brandon, Riverview, Apollo Beach or any of the surrounding areas. We’ll get there quickly to provide the assessment and service you need to get cool and comfortable again.